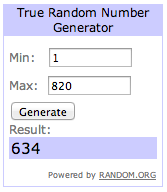 Life has been busy lately and I’m late on the bullet here, but I finally got the time to sit down and let you know who won the Picky Bars Giveaway That ended July 22nd. Thank you to all of you who visited and entered the giveaway! It’s been fun to see how many of you have tried Picky Bars or are curious about then and also really interesting to read about what kind of bars you like. Thank you all! Congratulations Amy! Send me an email (evelinruns[at]gmail[dot]com) with your shipping information and Picky Bars will send your goodies out to you. Categories: Giveaways, Reviews | Tags: Picky Bars | Permalink. 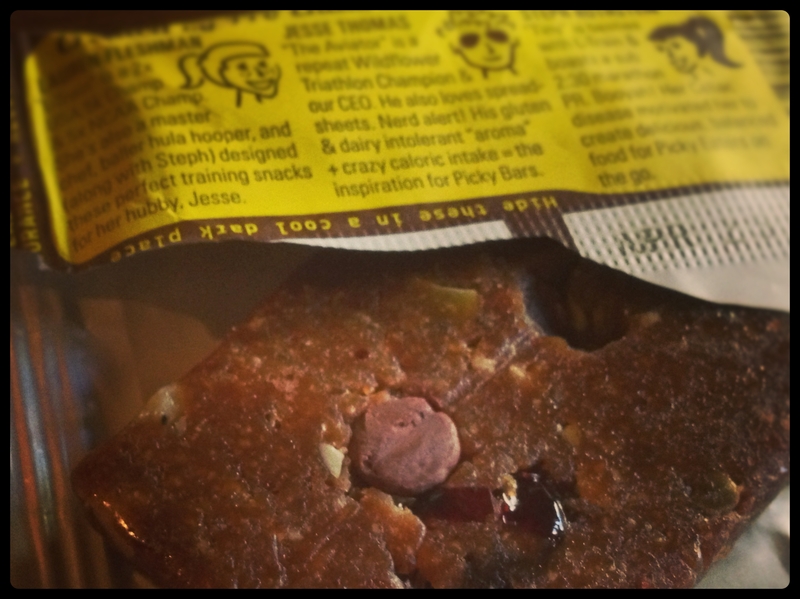 Picky Bars Review and Giveaway! The stars (yes, they are all actually stars) behind Picky Bars are Stephanie Rothstein, Lauren Fleshman and Jesse Thomas. It all started with Lauren wanting to find the perfect bar to fuel her husband Jesse. They were looking for a good and smart balanced gluten and dairy free bar. There were many to choose from on the market, but none of the existing ones hit the spot for the two athletes. So Lauren who knew exactly what she wanted set out to create her own bar for her husband in training. It just so happened that Lauren and Stephanie, Laurens training buddy, were both injured and had time to kill (and knowing how being injured felt for me, I kind of get a feeling it was a good way to stay sane – a project to keep them occupied!) so they spent countless hours experimenting until they had a perfect balanced AND perfectly tasty bar in front of them. This was the start Picky Bars, and since then they’ve released three other bars and they are also just now in the end of July releasing a fifth flavor! The day I got the sample pack of Picky Bars I immediately wanted to go for a run, so that I could justify having one of the bars. Yes, that’s how excited I was about getting to try these bars out! You probably already know that I like snacks that are as clean and natural as possible, and Picky Bars definitely hit the spot for me! I loved every single bite I took from these bars (and wish I would’ve been able to make them last longer). 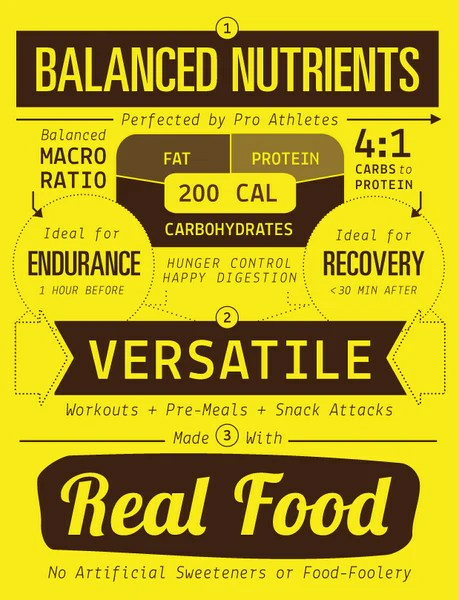 I used them as fuel before a run, as a recovery snack post-run and as a snack while being out hiking and.. Yes I admit, one of them might have just served as an awesome treat, just like that, with a cup of iced coffee. The bars all filled me up just enough, to that point where you get some energy without the “food coma” part. I have to admit I always get pretty nervous when trying something new before a run or a hike, but just as great as the bars tasted as great did I feel being fueled by them out running and hiking! 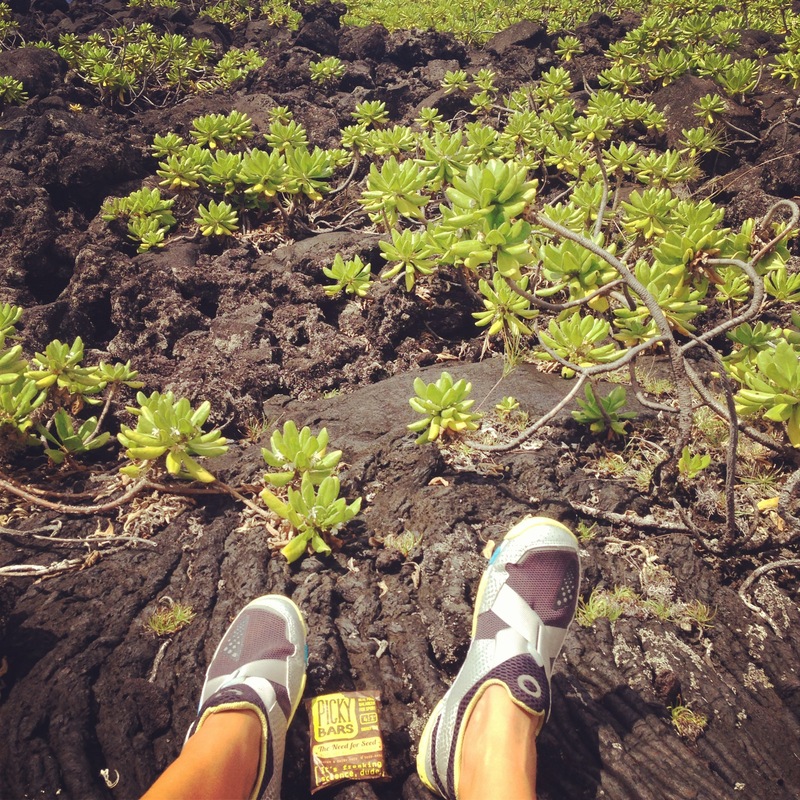 PickyBars served as a totally awesome snack while out hiking on the lava! Even though I’m a serious coffee drinker I usually stay away from caffeinated bars, gels etc. before heading out for my runs. No matter how used to caffein my body is I just can’t get away from the fact that my belly tend to get sensitive while running. BUT, the Smooth Caffeinator was actually the bar I tried before heading out for a run and I had no problems at all! In fact, I went for my longest run post-injury being fueled by that Picky Bars! (I’ve smashed that distance by now though!). My favorite.. Do I have to pick one, really? I don’t think so – they all are great! But I guess I’d go for the Smooth Caffeinator. Or All-In Almond (if you are following me on Twitter you might have noticed my obsession with almonds – I eat them daily AND always use almond oil instead of body lotion)..
Let’s have a look at the ingredients in one of the bars? Let’s do the Smooth Caffeinator, just because.. I like coffee? Ingredients: Organic Dates, Hazelnut Butter, Organic Agave Nectar, Rice Protein (Protein from Whole Grain Sprouted Brown Rice), Organic Crispy Brown Rice Cereal, Hazelnuts, Organic Chocolate Chips (Evaporated Cane Juice, Organic Chocolate Liquor, Organic Cocoa Butter, Organic Soy Lecithin (non-GMO), Organic Vanilla Extract), Cranberries (Cranberries, Sugar, Sunflower Oil), Organic Apricots (Organic Apricots, Organic Rice Flour), Fair Trade Organic Coffee, Sea Salt, Organic Cinnamon, Organic Safflower Oil, Natural Vitamin E (to preserve freshness). Looks great to me! And it sure tastes great too! Looks pretty darn tasty to me! I don’t just like the taste and how well the bars treated me, I also like the visual concept and the playful wording Picky Bars use – love the look of the packaging, the names etc. I agree, it IS freaking science dude! And wait, there’s more! There’s a Picky Club, where you can sign up to get a Picky t-shirt, the chance to try new flavors, a discount etc and best of all: you get sent 18 delicious bars monthly! All that for $37/month! Oh and there is a new bar coming out soon, one that would LOVE to get my hands on ASAP! Runners High – Blueberry Vanilla Hemp Hustlin’, how wonderful doesn’t that one sound?! Gotta love the runners high, and I’m pretty sure as a runner you are really hustlin’! 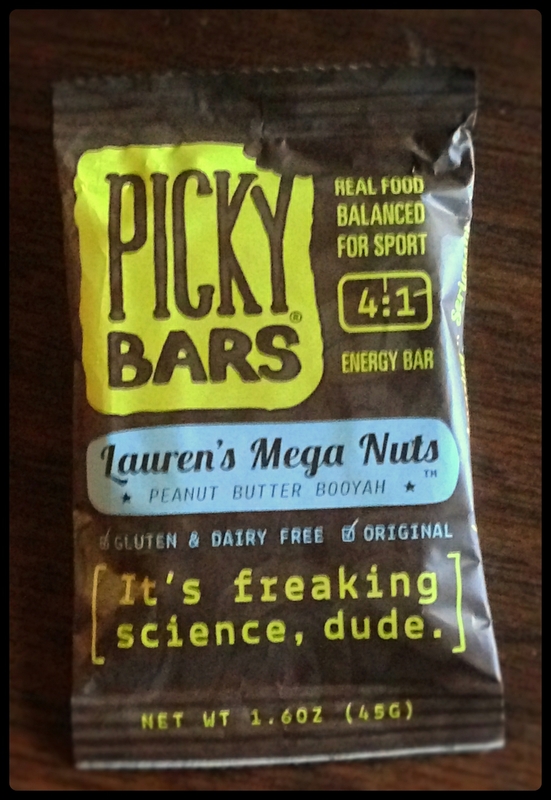 If you are excited about trying the Picky Bars, head on over to their website and order yourself some goodness. They are also sold in several locations, where of REI is one of the places. If you want to see where you can get Picky Bars in your town there’s a store locator on Picky Bars website. As excited I was to try out the Picky Bars as excited (or even more) am I to give you, my friends, the chance to try them too. Picky Bars are giving one of you the chance to win a sample pack of bars PLUS Picky SWAG! How great is that?! Yup, pretty darn great if you ask me! Head on over to Rafflecopter now and enter for your chance to win, I promise you it’s worth it! The giveaway is open July 14th 12am(HST) to July 22nd 12am(HST). 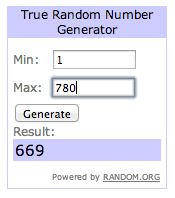 I will randomly pick a winner and let you know who the lucky one is in a blogpost. Disclaimer: I was given a sample pack of Picky Bars for free to try and review on my blog, I was not compensated in any other way. All opinions in this blogpost are mine and mine alone and they have not been controlled or influenced by Picky Bars or anyone else. Categories: Food, Giveaways, Reviews, Running | Tags: Energy Bar, Giveaway, Peanut Butter, Picky Bars, PickyBars, Review, Running, Running Fuel | Permalink. First of all, thank you so much for visiting my blog to read the Injinji review and enter the giveaway. I am amazed by and very happy about the interest you showed for these socks! Many of you all ready knows Injinji and love them just as I do and some of you are curious about the whole toe sock thing – I’d say you should be! If you get a chance to try Injinji out in the future – don’t hesitate! Brandon won by leaving a comment. So, there you go! Here’s our winner of the Injinji socks and Samples of GU Energy: Brandon! Congrats! Send me your shipping address and shoe size to email address: evelinruns [at] gmail [dot] com and I will get your information forwarded ASAP so that you get to put your toes in these awesome sock and match them with your Five finger shoes! To the rest of you, thank you once again for visiting and I hope to see you again! If your interest for Injinji’s is sparked and you want to get yourself a pair or two, visit their website. They are also on Twitter, Facebook (where they have competitions/giveaway at times) and Instagram. Check them out! Categories: Gear, Giveaways, Reviews, Running | Permalink. Injinji is an African term describing when a “drumming circle reaches a climax, the peak in the performance, when all of the participants are at one with the rhythm, when everyone hits a stride and there is unison among all”. This is what Injinji believes in and feel their community of athletes is all about. 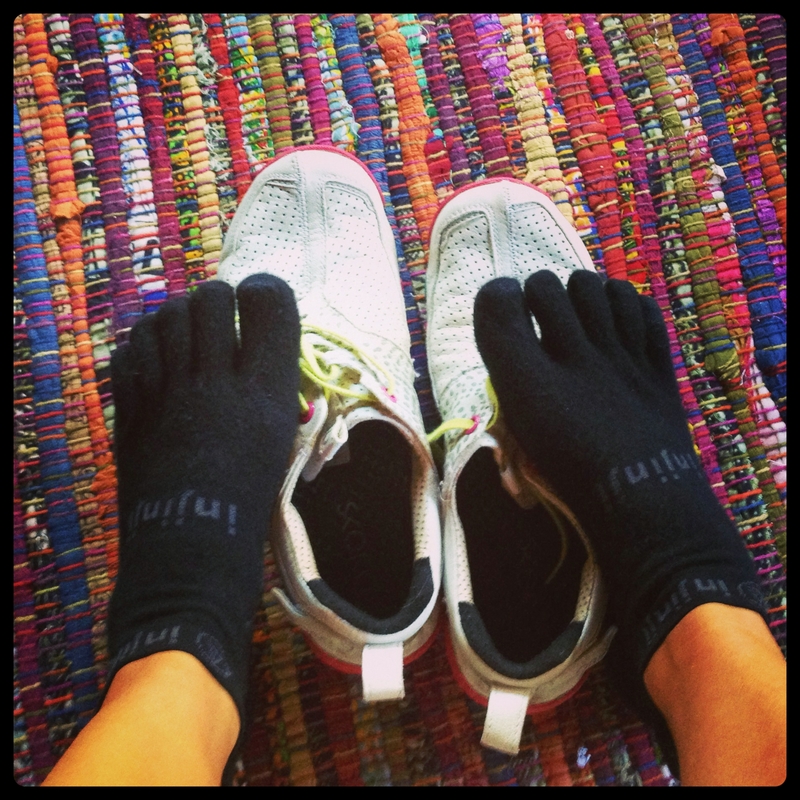 Injinji makes performance toe socks (for just about any activity) which will keep your toes/feet happy! Injinji was created by athletes for athletes with the “manifestoe”: “Forever committed to innovation that allows your feet to live and perform at their peak. We are a better way.”. Injinji offer a variety of socks for different activities and preferences. 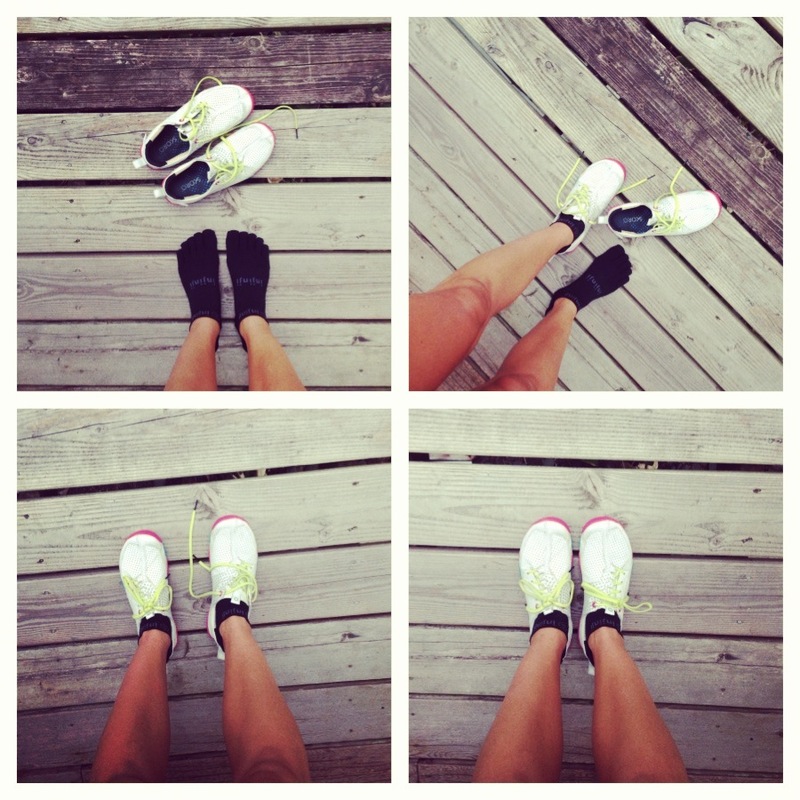 There are Run series, the Trail, Sport and Yoga socks as well as liners and even Compression socks! There are Light, Original, and Midweight socks to choose from depending on what kind of socks you prefer. They also come in different cuts (from No-Show to Knee highs) and colors, which makes it all even better. I’d say there’s definitely something for everybody (as long as you’re into the toe sock thing)! I first read about Injinji during fall 2012 and even though I was curious about them it took me a while before I actually tried them. 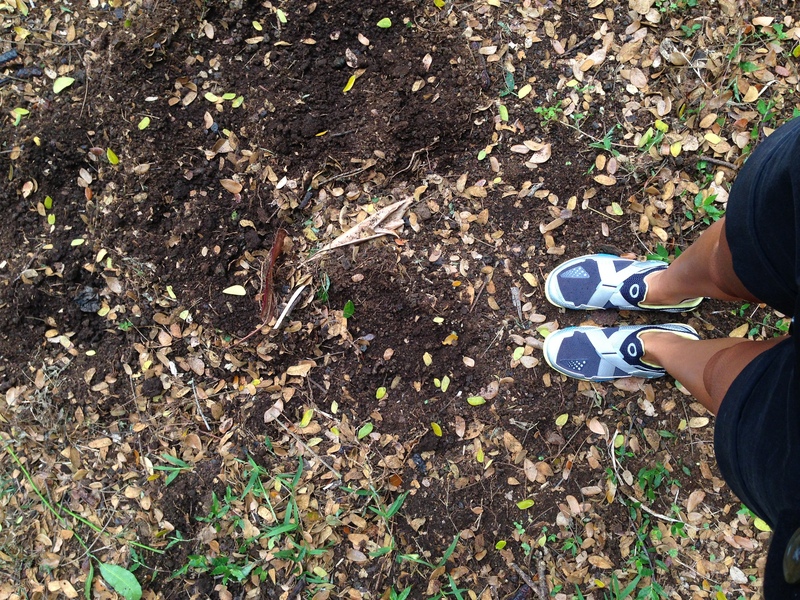 As I transitioned into my SKORA shoes and got accustomed to actually feel the ground more and running natural and relaxed I wanted to try the Injinji’s. Why not let the toes loose and actually be free to do the thing they are supposed to do? Splay and be a part of the forward motion while running. Another thing I was curious to find out was if the added fabric between my toes would be making my feet warmer/more sweaty or actually prevent that warm/sticky in-between-toes feeling I’ve noticed while running and post running? Yes, basically I was just very curious to see if my feet would agree with the above stated advantages in using toe socks. I received two pair of Injinji socks from their Run Performance 2.0 collection – the Lightweight and Original Weight No-Show. Being new to the toe sock business it was interesting putting the socks on. It kind of tickled and I couldn’t help but feeling a bit awkward at first but as I’ve gotten used to putting these socks it’s really not a problem. Sure it takes a few moments longer putting these socks on than a “normal” pair of socks, but once they are on they feel amazing! Really, like a hug for every single one of my toes. Running in Hawaii can cause pretty warm and sweaty feet and when I’ve been using “normal” socks I’ve noticed the sweat business a lot more than with these toe socks. I used to have some problems with getting blisters due too the sweat and the moist toes rubbing against each other – well, that’s not happening anymore! 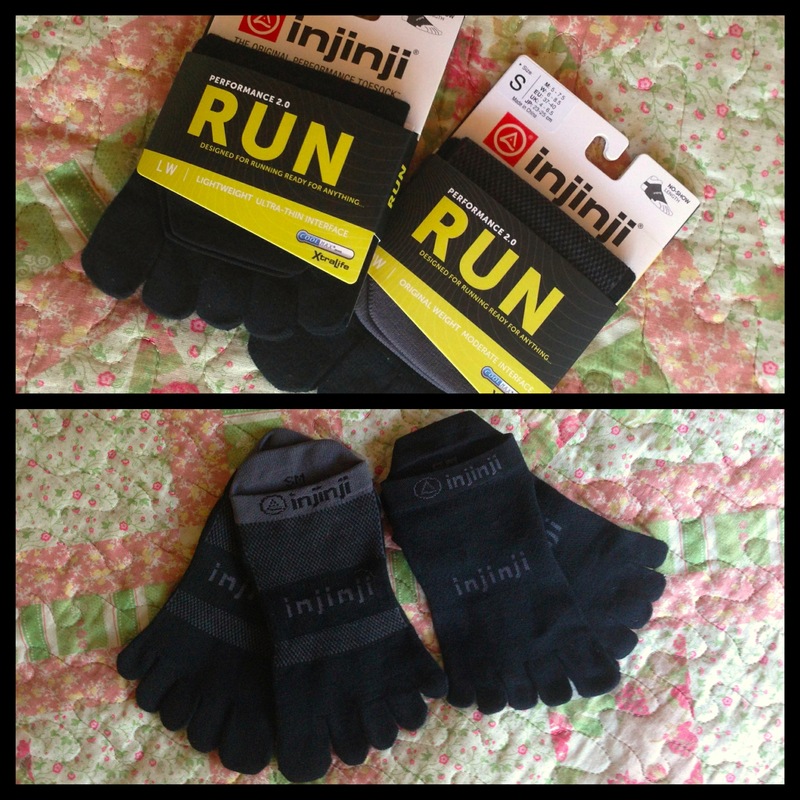 I agree with all of the above mentioned advantages from Injinji – these socks are really great for my feet! Injinji climbed straight up to the top 5 of my favorite running gear list and I have a feeling they will stay there. I’m already looking into getting more of the Lightweight Run 2.0 socks as they are my favorites to run in! Yep, I love my Injinji’s! Check the fantastic toe socks out on Injinji’s website, connect with them on Twitter, connect with them on Facebook, and/or follow them on Instagram. They are a great company with tons of fun things going on, great photos and they have amazing and inspiring athletes in their team! Now onto the giveaway part of this blogpost. There are TWO pairs of Injinji’s and samples of GU Energy products in the basket and one of you will be the lucky winner of it all! All you have to do to enter the giveaway is click the Rafflecopter link below and follow the instructions. Do one or all of the entry options – it’s all up to you! This giveaway will run from 7/2/13 at 12am (Hawaii) to 7/9/13 at 12am (Hawaii). I will choose a random winner and let you all know who it is in a blogpost here on Evelinruns July 9th. Disclaimer: I was given two pair of Injinji socks for free to test and review on my blog, I was not compensated in any other way. All opinions in this blogpost are mine and mine alone and they have not been controlled or influenced by Injinji or anyone else. Categories: Gear, Giveaways, Reviews, Running | Tags: Giveaway, Injinji, Injinji Review, Injinji Toesocks, Review, Run, Running, Running Apparel, Running gear, Running Socks, Toe Socks | Permalink. When I first saw SKORA shoes around on Twitter and visited their website I right away knew a love story had been born. At first somewhat a unrequited love story because we had actually never met. But lately, that love story has become REAL. I finally gave in and ordered those shoes I’d been more and more intrigued by and spent HOURS reading about and looking at (literally drooling over) online. I mean, come on! They are beautiful shoes?! I can’t imagine anyone really seeing a photo of them and NOT be impressed..
As I started my journey back from my injury I had my golden opportunity to transition into these shoes with no pressure. And boy/girl, do I enjoy the journey I’m on! Since before I had the SKORA’s I’ve been doing short barefoot runs and really feeling the benefits from them and now also from running in these shoes. 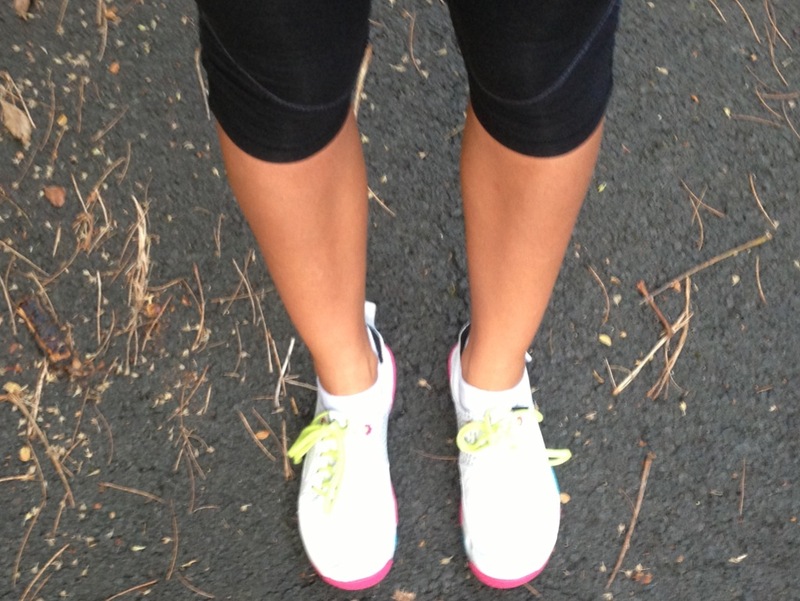 My feet are loving it and so is my running form! The way I feel after switching to these shoes from my old ones is.. Something else(as in awesome)! The efficiency in my movement and the natural feel is so great. With the SKORA’s I feel like I’m flying. I know, I’m not that fast but that doesn’t stop me from feeling like I am. 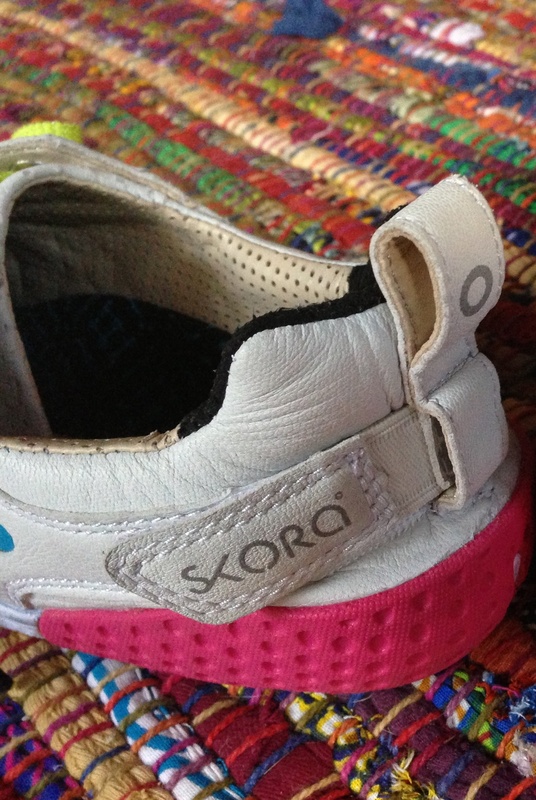 SKORA is all about “real running” (Maybe you’ve seen the hashtag #RunReal on Twitter? Well, that’s SKORA for you!) and I totally get it. No actually, I FEEL it! I’ve been using every time I leave the house as an excuse to wear my SKORA shoes. Honestly to the point where the question is no longer “What shoes should I wear today?”, it is “What SKORA shoes should I wear today?“. I’ve been using the Form’s mainly for running but also everyday wear, and the Bases for hiking/everyday wear. If I’m going to the store or into town to run errands I love being able to slip my Bases on my feet, without socks, and just be ready to roll! I’m a terrible poser. Like in I kind of hate it. That’s why I suddenly start scratching mosquito bites when husband is trying to take a photo of me.. But hey, at least he got my pretty shoes on the pic! These shoes are zero drop, which means there’s no difference in toe and heel elevation from the ground. However, these two models have a stack height of 13mm with insoles still in, which means the soles of your feet will be separated from the ground by 13 mm. The Form have asymmetrical lacing which I really like. It seem to take a lot of the pressure off the foot where for some people too tight lacing might get painful or numb the feet. The Base have a crossed strap system which closes with velcro and they fit like a sock. And they really feel like a sock! Both models have a heel strap which you can tighten to get the shoes to really hug your heels, I really like this because I have pretty narrow heels and have had some problems with this in the past. I’ve been transitioning into these shoes from my old traditional running shoes and am very happy with them. If you are curious about the shoes, head on over to SKORA and look around. They have an awesome blog too, with a lot of tips and tricks that can help you with your running – like transitioning into their shoes or just improve your running. I love this blog and am always happy when they update. As a matter of fact, once I’m at it I’d like to inform you that SKORA is doing a daily giveaway of shoes (until May 10th) to celebrate the Base being mentioned in Men’s Health. Head on over to this blog post and make sure to enter daily. I know I’d take every opportunity to get a pair of SKORA’s on my feet if I didn’t already have two pairs to proudly walk/run around in! Um, to be completely honest I’m already craving more of the SKORA’s and wouldn’t be too surprised if I gave in and ordered more in the near future.. There’s just too many great looking shoes to want more than one (two in my case) pair! Categories: Gear, Giveaways, Running | Tags: Footwear, Run, Running, Running shoes, RunReal, SKORA, SKORA Base, SKORA Form, SKORA Running | Permalink. Congratulations Margaret! Please send me an email with your information (which color and size of Marathon Sock you’d like plus shipping address) to evelinruns[at]gmail[dot]com and I will forward your information to ProCompression! To all others who visited my blog and entered the giveaway – thank you! It was so interesting to hear how you use or how you’d like to use ProCompression socks for working out, running or recovery. I hope you all get to enjoy using ProCompression socks in the future! While I’m at it, I’d like to remind you of the 10% off code on the Hüma Chia Energy Gel I get to share with you. As I like to fuel all natural for my runs I love the fact that there are natural gels, easy to grab and go while being great tasting and easy on my belly! You should check them out! Categories: Giveaways, Reviews | Tags: Chia Seeds, Compression socks, Coupon Code, Giveaway, Hüma, Hüma Chia Energy Gel, ProCompression, ProCompression Marathon Socks | Permalink. Since I started running in May 2012 thinking that all I needed was a pair of shoes I’ve come to realize that there’s a lot of products out there that will be really helpful and fun while making it more enjoyable to run/recover from runs. Compression socks is one of those things. I’ve used compression socks throughout the years while being on long flights across the world, but most of them have left a lot to wish for. They’ve been stretching out, been too tight or simply breaking due to being too thin. But then I heard of the brand ProCompression. And saw all the fun photos uploaded on Instagram, Twitter and blogs. I started craving them, a lot, and finally got a hold of a pair of pink Marathon socks in the start of 2013. Since then, these wonderful hot pink socks have been frequently used by me. They have been working out with me, running with me, helping me recover after strength workouts, runs or just a stressful day with hard work or a lot of walking. Even though I’m “just” 30 years old my feet easily swell up – with the ProCompression socks I quickly recover and feel better pretty much right away. I love it! The fact that ProCompression also comes in a bunch of fun colors doesn’t make it worse, not at all! 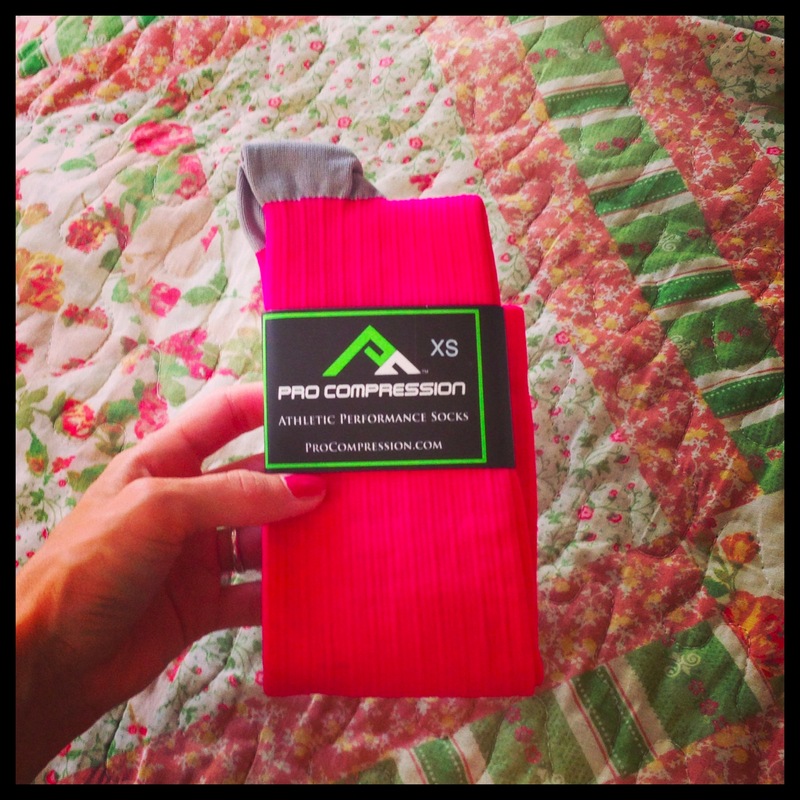 The lovely people over at ProCompression gave me the chance to spread some ProCompression love by hosting a giveaway here on the blog. So if you’re curious about the socks, already have a pair (or many) and love them or if you’re just into trying new fun stuff – here’s a chance of winning a pair of Marathon socks in color/size of your choice. All you have to do is click the Rafflecopter link below and follow the instructions. This giveaway is over and I’d like to send a big thank you everyone who entered! Giveaway information: The giveaway starts 4/8/13 at 12am (HST) and ends 4/16/13 at 12am (HST) and is open to US residents. I will randomly pick 1 winner. 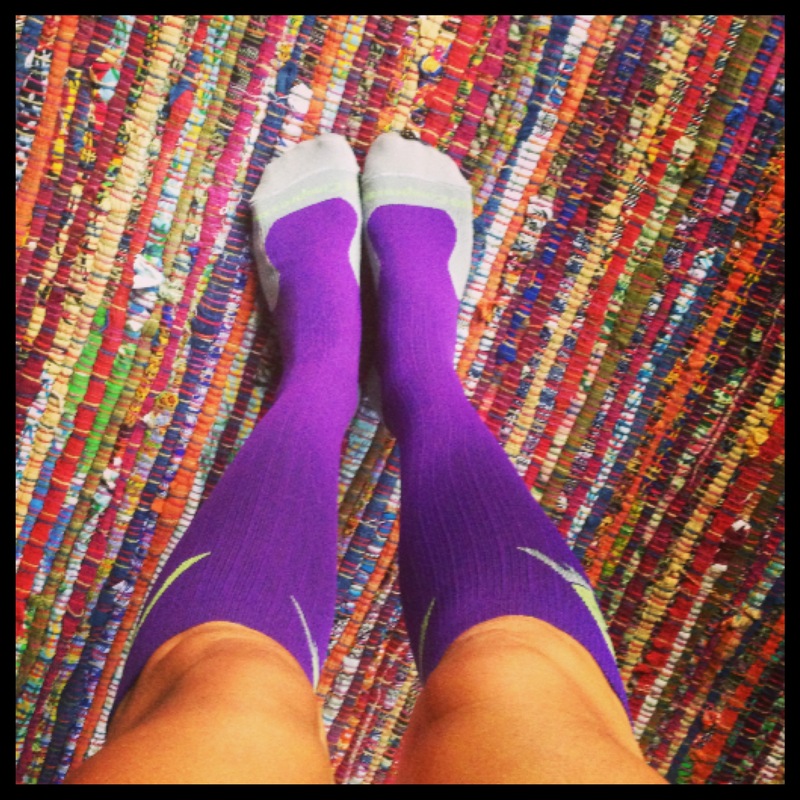 The winner will be posted on the blog 4/16/13 and will be asked to email me address, choice of Marathon Socks and size. Disclaimer: All opinions in this blogpost are mine and mine only. I haven’t been compensated in any way by the company. Categories: Gear, Giveaways, Reviews, Running | Tags: Compression socks, Giveaway, Marathon, ProCompression, ProCompression Giveaway, ProCompression Marathon Socks, Running, Running gear, Running Socks | Permalink.